Initially when tattooing migrated westward, the association of tattoos and the exotic appealed to the upper class and made tattoos a status symbol. According to the upper class, tattoos were a sign of cultural knowledge, in this instance, those that were tattooed were thought to be "cultured." The middle and lower classes on the other hand, thought of tattoos as merely a wealth indicator because the tattooed person must have had enough money to travel in search of an emerging tattoo artist to design and create the tattoo. 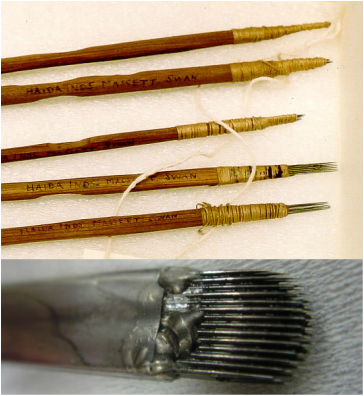 Tattooing was initially performed with a set of needles attached to a wooden handle similar to the Japanese Tebori method. The needles would be dipped in the ink and the tattooist's hand would move up and down vigorously, pricking the skin two or three times a second. While this technique was time-consuming, tattoos were still popular among the upper class until the invention of the electric tattoo machine. 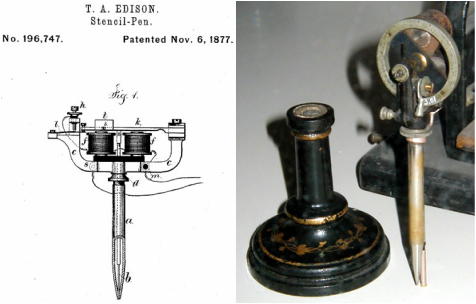 This device was originally invented in the U.S. by Samuel O'Reilly in 1891 and its design was influenced by Thomas Edison's electric pen, that created a stencil as someone wrote to be later used as a stamp, which later became the perforating pen used to punch holes in telegraphs. With the new innovation of the tattoo machine in the tattooing world, tattoos could be made more rapidly because of the multiple needles operating simultaneously, and for less money, which made them more accessible to the middle and lower classes. As more people began obtaining tattoos, their association with wealth diminished and the practice was abandoned by the upper class. Margo DeMello, who attained her Ph.D. in Cultural Anthropology and is currently a professor, further suggests that tattooing perceptions among the elite shifted with the invention of the tattoo machine and they went back to associating tattoos with the unsophisticated. As mentioned above, the oldest Japanese method of tattooing is known as Tebori, meaning "hand carved," in which the artist uses a tool called the nomi, a sharpened bamboo stick. With the nomi, the artist hand pokes the ink into skin to create a design. Through researching this technique, I found an interview of Horimyo, an apprentice to a traditional Japanese tattoo artist. Before his apprenticeship, he used the electric tattoo machine. Horimyo saw his soon to be master's work and thought that his works were "really cool." This is when he decided to become an apprentice. While Horimyo admits that some tattoo designs would be easier with the tattoo machine, he feels that the Tebori technique is truly amazing and needs to be passed on to further generations. According to Horimyo, one must be in shape to create good works and therefore the method is like a discipline. When he is no longer able to hand poke, Horimyo says that he will go back to using the machine but until then, he wants to do everything by hand while he still can, including the designing. Because his tattoos are done entirely by hand, he feels that his tattoos are more like "craftsmanship and art." Horimyo tells us that, "All handmade is the most valuable thing in any genre." 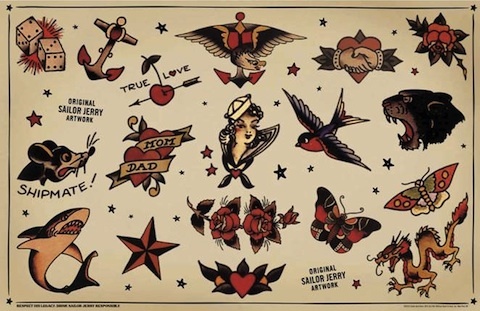 In the 1920s, Sailor Jerry, used a form of the hand pricking method, that he learned while in the Navy, to become one of body art's most famous practitioners. Jerry's designs often depicted images of anchors and rum bottles. 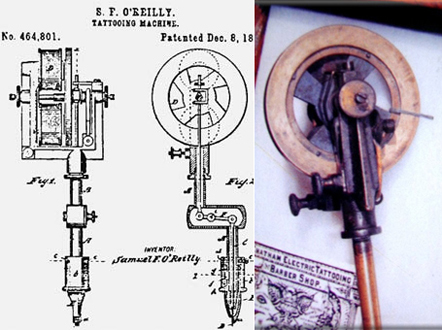 While the U.S. developed and electric tattoo machine, most tattoo artists today would be found using a tool similar to the Cheyenne Hawk Thunder, made in Germany. The German machine contains a disposable cartridge that combines the grip and needles which has changed the way tattoo artists can design tattoos because the machine mimics the feeling of holding a pen. Now the tattoo artists' movements are now more fluid, versatile, and graphic. With this new innovation of technological change, artists can now use a second technological advancement of computer and digital design. This means that artists no longer need to go through endless periods of hand drafting tattoos and can instead draft tattoos through Photoshop and other imaging software. Using the computer programs, artists can alter color, scale and details all very easily, and create a layered imagery design that was possible through drawing. The German studio Buena Vista Tattoo Club for instance, began a design trend called "Trash Polka," in which the designs consisted of digital pictures merged with text, graffiti art, and shading to create a more realistic and painterly design. Tattoo artists are able to play with the old theme of image-text design through the use of technology to layer text with asymmetrical line work and abstract imagery to mix different modes of art such as drawing and painting into one collage looking tattoo design. While Horimyo said that handmade creations are the most valuable, Xoil, a tattoo artist from Needle Side Tattoos in a French town called Thononles-Bains, says that digitally designed graphic tattoos in no way lessen the artistic value because each tattoo is an original creation that reflects an artist's signature style. Furthermore, image software has made it possible for people obtaining tattoos to perfect their design and not be reliant on their particular tattoo artists drawing style. 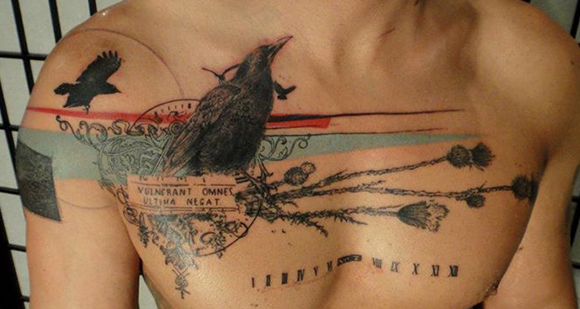 Now graphic designers can design tattoos which adds a new dimension to tattoo design. When comparing the Tebori method to the developed Western methods from the hand pricking to the developments in the tattooing machine, DeMello tells us that in comparison with Japanese tattoos, American tattoo design seems like, “a series of small, independent, badgelike designs placed haphazardly on the body” (DeMello). DeMello further suggested that Tebori allowed the Japanese to avoid awkward blank gaps in tattoo design by molding individual designs into a thematic background. These backgrounds usually depicted wind or water which added an element of movement to the overall design and this illusion of movement helped tattoo artwork gain aesthetic value. During the 1960s and 70s in America, for instance, people began obsessing over Japanese design and the adoption of Japanese design techniques revolutionized the American tattooing art world.